Here’s a new post in my course about developing Android apps with Bluetooth functionalities. 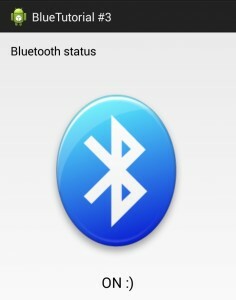 In this tutorial I’m going to show you how to detect a state change of the Bluetooth module. Android is a multitasking operating system: while our application is running, the user or a different application may change the state of the Bluetooth module, for example it can be disabled. In my first post, you’ve already learned how to ask Android to activate the Bluetooth functionality; in a similar way you can also ask again Android to notify to our app any changes. First, create a BroadcastReceiver that will receive the notifications from the O.S. As usual the source code is available on Github!